It’s good to see that there is a decent amount of interest in urban matters amongst Wellingtonians, with a couple of recent posts sparking off some healthy discussion. �The debate on Manners Mall about the extent of Te Aro Park and the eventual removal of the failed Oaks complex, bought to mind another potential park a bit further up Cuba St.
First brought up by a friend of mine a couple of years ago, and he’s never stopped banging on about it since, there’s a piece of land between Ghuznee and Vivian that is the absolutely perfect place for a park. A park for People, not the ground level park for Cars that it is now. Yes, the small square of asphalt known as the Swan Lane Car Park – that goes through to the Marion St Post Office, has been decreed by some to be the most divine spot possible for a park for people. It’s certainly wasted on the cars that sit there all day seeping oil into the asphalt. Photos here taken about 8pm at night – the sun has only just left the Square. There is a lot going for a park in this position, including the general ambience of heritage buildings on 3 sides, interesting apartments on the 4th side; a high pedestrian traffic count past it all day and night long; a goodly proportion to the space (neither too deep nor too wide); and best of all: fantastic sun coverage all day long. It would differ from a park at the Oaks complex by being less windy – the present Te Aro Park can be lovely on a nice sunny day, and a good place to go to eat lunch and (if you should so desire) feed pigeons. But when the wind whips up the waves so loud and the ghost moon sails among the clouds, Te Aro Park really is on the border of being uncomfortably nasty to be in. Coupled with an unhealthy dose of diesel dust and traffic dirt from both north and south of the park, and an awkward narrowing at the prow, the present park is less than useful. And yes, we know, the Council have only just finished ‘refurbishing’ the limestone pathed jungle of Glover Park, which is ever so close (physically) but ever so far away (emotionally) and has never really felt part of Cuba St at all. Perhaps that’s because it is on the edge of a busy road, perhaps that is because it has the wrong proportions or is surrounded by tall buildings, or perhaps it is just the simple matter that it is not on a route for pedestrians and so is forever doomed to failure. Swan Lane, on the other hand, sits in an intriguing tangle of intersecting lanes and sightlines, through to Marion St, down the back alley to the brothel and the paint shop, or back up Garrett St under the arched building that fronts onto Victoria St. Or perhaps just the tasty treats of Duke Carvell’s, or Floriditas Cafe – scrumptious, both of them. For whatever the reasons, Swan Lane works – all day long. 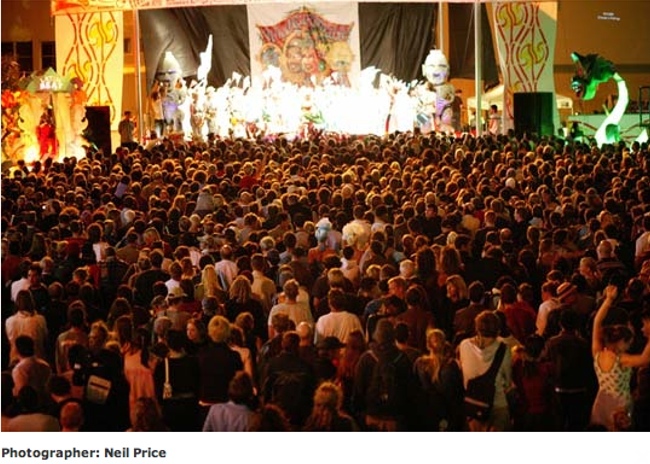 Let’s savour it – and then save it – for the people of Wellington. I thought the car park in question was privately owned? Is this correct? I had heard that the council tried to swap the Glover Park land for the car park in the past. 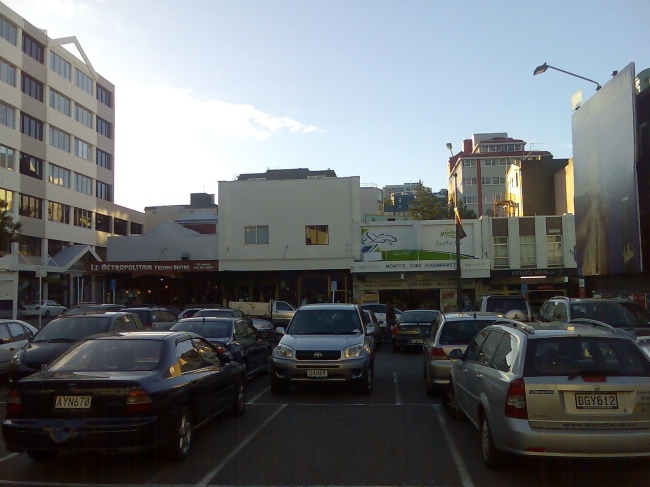 JJ – yes the carpark is privately owned. But that should not stop the Council doing what is best for Wellington. It’s owned by a very nice man, who doesn’t want to sell just yet. What is important is that the Council starts to act now to protect it as an open space, and stop it being overshadowed by more places like the Metropol. Description: A paved parking lot with about 60 spaces. Tenant List: Operated by Wilson Parking. Owner: Pavilion Properties Ltd, 9 Box Hill, Khandallah, Wellington 6004. Pavilion Properties is owned and directed by Ian W Utting of Khandallah. Sales History: Macklin Holdings Ltd bought properties 8, 9 and 11 from the Public Trustee for $1,200,000 in September 1994. This property was bought by Pavilion Properties Ltd in May 1995. 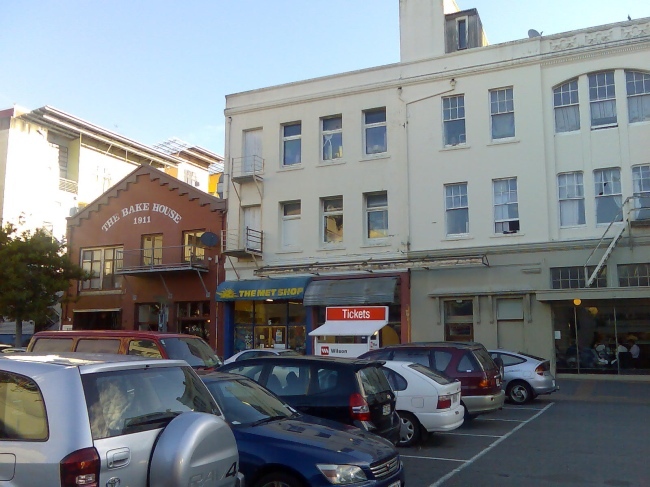 Street Frontages: 24.57m to Cuba Street. Title Details: Lot 2 DP 79547; CT 46A/256. Yes, indeed; Swan lane would be excellent as a park. The aspect, location and general feel of the place is so perfectly suited to such a use that even in its current state, with ugly asphalt covered by ugly cars, it seems to invite one to step off the footpath and linger. It needn’t be fancy, or clever or filled with ‘interesting’ seats (I’m thinking here of Manner’s Mall). A spot of grass, the odd tree and a place to sit would be enough to make the place a pleasant and, I think, well used park. Not that I’m saying more ambitious designs would be undesirable, but for a space that feels so close to being a park when it isn’t one, any steps which bring it closer to park-ness would have a positive effect. Absolutely. I agree – it wouldn’t need to be fancy-dancy. I don’t think upper Cuba Street is that sort of place. What I would like to see though is connections – landscaping elements (paving, seating, features….) 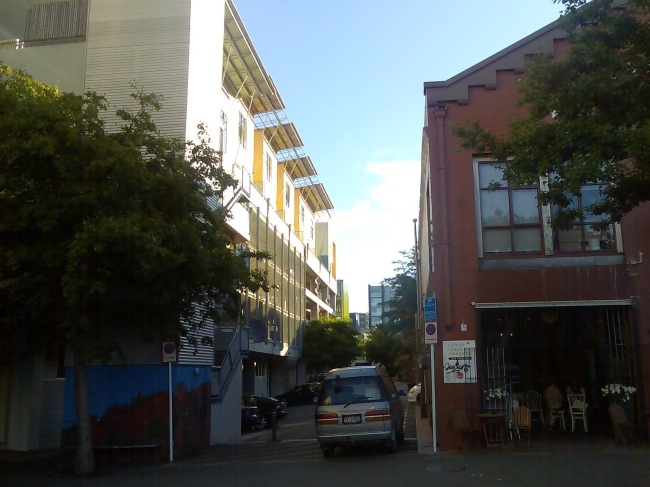 used through to Marion Street (underneath the big ugly apartment/parking building), and across Cuba Street to Garrett Street to “grab hold” of Glover Park. Perhaps a couple of areas where Floriditas and Duke’s could spill out into the space also…. It would be a beautiful little urban enclave. Yep – used to walk past it every day on the way to work years ago and thought the same thing – wasted as a carpark. I agree with the comments about it not needing to be fancy: a decent square of grass in the middle for people to lie about in the sun, but paved around the perimeter, with some basic seating and some trees here and there. Maybe the owner might be more tempted to sell if we changed the name. “Utting Park”?? The Swan Lane car park reminds me of the sort of thing you see in old photos from the mid 20th century, where there’d be an iconic building like Parliament bleakly surrounded by chunky parked cars. It’s the sort of thing you’d expect 50 years ago, when mass automobile use was new and people were still figuring out what to do with cars. 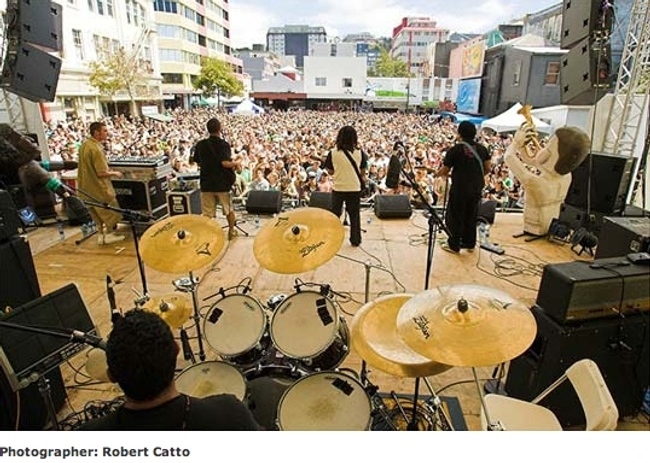 Mobsta�s post of 11 December at 9.16 reads to me like a direct quote from �Wellington Cityscope�. If so, it would polite to acknowledge that. Other readers might well like to know where they can read it. Can Mobsta tell them? I did not realise that it was etiquette to acknowledge it. I thought I was just providing information. No problems. My apologies. Excellent idea on Swan Lane. Interestingly, the $1.2m that Swan Lane sold for in ’94 is the same sum the council spent upgrading Glover Park – which, now that the homeless have moved out, is used by scarcely anybody at all. Further to the Oaks discussion, Craig Bailey of WCC says that the Oaks land is owned by the council, which leases it on a 21 year perpetually renewable ground lease to the owners of the building. Presumably this means the council would have to buy out the leaseholder if it wanted to use the land for public purposes. I imagine this could be rather expensive. 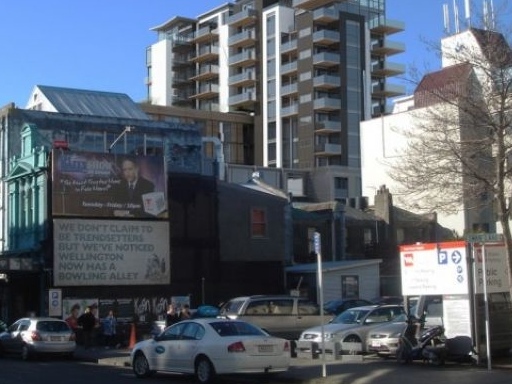 Perhaps however there could be a tradeoff for commercial use of the pointy (Taranaki St) end – e.g. a building combining public toilets and a cafe. Why not do your own Private Plan Change? Anyone can do a Private Plan Change on any piece of land anywhere – which is what developers do sometimes – initiate then buy out the owner. It’s easy enough to do one – refer to the legal lot, state the zoning on the lot to be rezoned from x to y, and importantly, give reasons why e.g. the social benefits outweighs the economic benefits and the environmental benefit is far superior to current use. Submit to Council and bobs your uncle, zoning is changed and you have your public open space (well, bobs yer uncle is the super fast version of events). I’ve always thought this would be a great public space, but perhaps another row of small shops/cafes on the north face to give it another active edge, and then something simple in the middle with lots of grass and some trees. There’s substantial cost involved – in people’s time, and Council officer’s processing time. While I’d be happy to put in the hours on this as a Plan Change, what it really needs is Council ‘buy-in’ as a concept, as well as having a Mr Utting willing to sell – to make it a reality. But yes, the first step is to get the Plan Change under way. Perhaps our ever helpful Mr MacLean may be able to offer some helpful words? 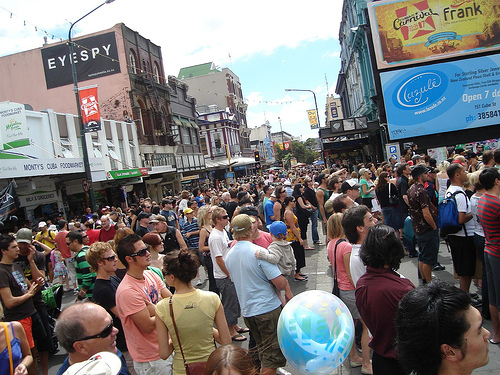 a row of small shops right on Cuba St will break the connections that work so well at present. Better than that, is the idea to have the whole perimeter of the square as open / active edges, such as the Duke Carvell and the Met Shop. A restaurant like Floridita is absolutely gagging for the ability to open up to a usable pavement – at the moment their patrons would have to sit in the car lane. The back of the Galleries such as Enjoy and McLeavey, and the back of the little shops to the north would all work so well opening out into the square. Their foot traffic down Ghuznee at the present is miserable by comparison. Instant winner all round. I suspect that this discussion has been initiated by an operative of the land owner Ian Utting. With the property market tanking he has know doubt realized that he has little chance of realizing any capital gain on the land so would know doubt love to get rid of it for a hansom profit by selling it to the WCC. He was asking too much for it previously so he will be loving all this talking up the sites potential. “discussion has been initiated by an operative of the land owner” ? Not knowingly, no. The site could get much more if there was a building on it. 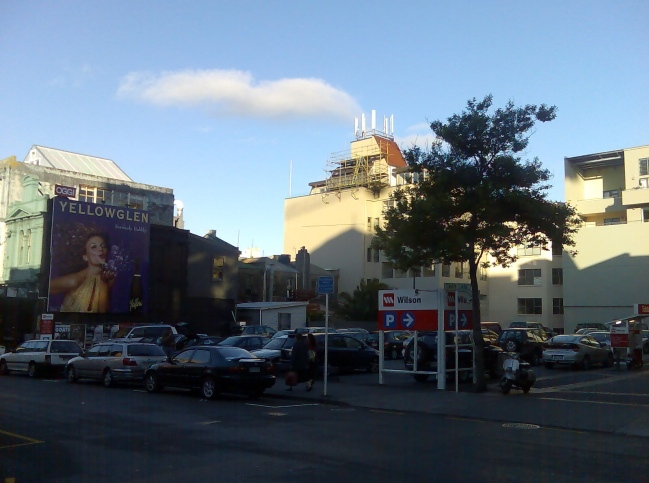 But it’s best use is as a public area – and there will be no profit for the council in that, only warm feelings of gratitude from many Wellingtonians. Interestingly, the only pedestrians who find Glover park useful for getting about usually walk through the shabby little carpark on the opposite side of Garrett St which connects to Vivian St via Bute St. It doesn’t have half the promise of Swan Lane on its own, but if you are trying to get Glover park to ‘work’ then you could do a lot worse than look at the potential of that little piece of concrete….